The project is developing a methodology to set up a regional evaluation mechanism which will analyse how comprehensive and accurate the monitoring and forecasting datasets are at the basin scale. The analysis is run through 7 major marine/maritime challenges like windfarm siting, marine protected areas, oil platform leak, climate and coastal protection and fisheries management. What marine data related to human activities is available for the Mediterranean Sea region? What is the role of EU initiatives such as EMODnet and Copernicus in providing information? What are the priorities for marine observations, better data assembling and data dissemination ? The Mediterranean Sea checkpoint focuses on matching existing data services to solve particular challenges like windfarm siting, marine protected areas or oil platform leaks. It does not deliver data itself, but supports users in making explicit the value of data in solving these challenges. In this way users can understand if they are embarking on a similar or related challenge whether adequate data is available and where to get it. The monitoring system assessment activity is based upon targeted end-user applications. The innovative outcome of this evaluation will be the depiction of ‘fitness for purpose’ indices capable to show performance and gaps of the present monitoring system. 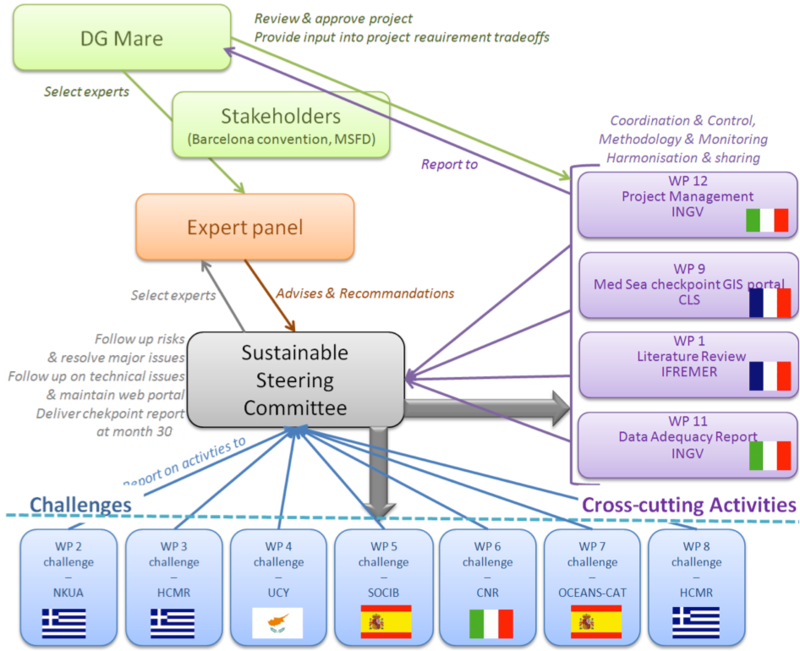 The work will consider a practical assessment and rapid result dissemination, it would provide a basis for rational decision-making, getting the status of the Mediterranean Sea observing and modelling infrastructure, analyzing gaps and identifying priorities to optimize the regional monitoring and sampling strategy. The evaluation mechanisms relies on the production of checkpoint data (or targeted production from challenges), checkpoint information (e.g. quality metadata, checkpoint indicators) and checkpoint data adequacy reports to identify gaps and priorities in the observational networks, in situ and satellites, analyses and forecasts and data geo- infrastructures, archival and assembly centers. All project outputs are made available through the Med Sea Checkpoint portal to support the assessment of the information flow and to enhance the design of the European observing infrastructure. The checkpoint uses web ontology standards to link available data to particular challenges. Assembled data and related targeted products, made accessible through the portal, can be used in other studies and projects in the Mediterreanen Sea. The general methodology based on testing the data against specific end-user challenges is shared among all other EMODnet Sea Basin Checkpoints. The European Marine Observation and Data Network (EMODnet) is a long-term marine data initiative funded by the European Maritime and Fisheries Fund, which together with the Copernicus space programme and the Data Collection Framework for fisheries, implements the EU’s Marine Knowledge 2020 strategy.